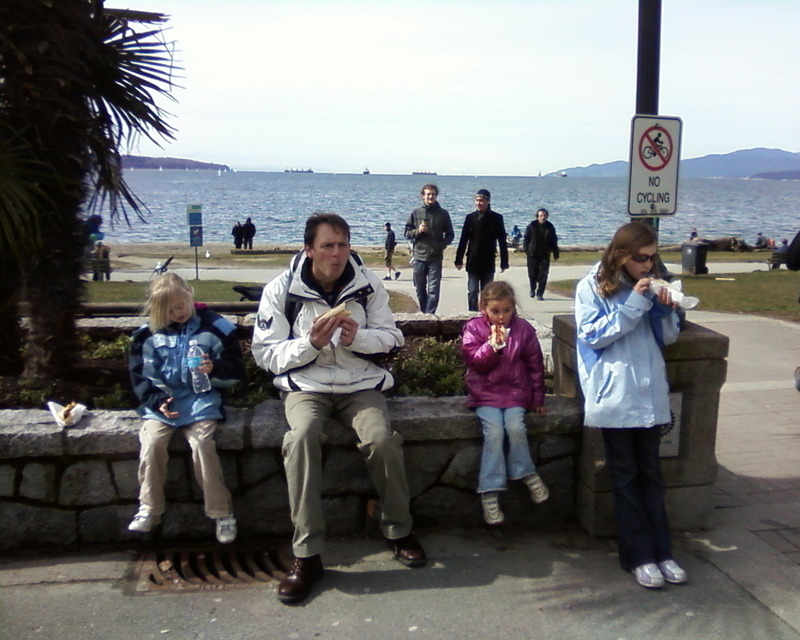 The Great Canadian Adventure – into the third week (originally posted Mar 27/09) | Damian Trasler's Secret Blog - Do Not Read! You call 'em hot dogs if you like, it's indiginous cuisine to us. The best and worst of this move so far is the confined living space we have chosen for our first few weeks. The apartments here at Stanley Park are lovely, containing pretty much everything a family needs to get by, plus having the advantage of being next to the park with all it’s amenities (and great views etc) and also handy for Downtown, as long as you can manage buses and the Skytrain… The downsides: It’s a two bedroom apartment, so if you’re not in your bedroom or the living room, you’re in the bathroom. Chances are, if you’re in the bathroom, then someone else is hammering on the door because there’s five of you living there and only the one toilet. Long restful baths do not occur here. Another downside is the scale of things here. We really need a car to get out to some of the places we need to go, but that means negotiating the mad roads of Downtown in both directions, and it doesn’t matter when we set off or where we’re going, we always seem to catch rush hour on the way home. One time we got so confused by the “Don’t turn right between 9am and 7pm” signs everywhere that we missed our road and took an unscheduled trip over the Lions Gate Bridge to North Vancouver. Nice scenery. For me the main points of the last week have really been the fact that we can’t take much of a break from each other. The Weasels are behaving really well, and when I remember what they’ve had to give up just because we said it would be a good idea, I can’t believe how good they are. Trouble is, I don’t remember that often enough, so things can get pretty stressed at times. We went car hunting, since the Hire Car was approaching the end of it’s lease, but after three dealerships I couldn’t cope anymore. The Weasels viewed each showroom as a playground, and each car on display as an opportunity to wipe the mud from their boots. Also, I don’t do the money thing. Mrs Dim has an accounting brain and she has kept us off the financial rocks all our married life (a claim I’m particularly proud of in these uncertain times) but she has strolled into realms of Quantum Accounting in these past few weeks, juggling multiple accounts here and in the UK, trying to track real and forecast expenditure, trying to sort out living expenses from startup costs, and converting everything back and forth from Sterling to Dollars. I know, roughly, what kind of car I’d like. She knows, roughly, how much we can afford. Getting those two ideas to meet in the middle is hard enough, but if you can’t hear what the salesman is saying about purchase incentives and tax breaks because Biggest Weasel won’t give up her spot and let Middle Weasel put her head out through the sunroof too, then it’s damn near impossible. Plus it means you don’t know where Tiny Weasel is until you hear the crash. The huge volume of e-mails (going both ways) has tailed off a bit, as have the number of phone calls home. We stumbled a little the other day, having promised a friend we would call at 6pm UK time, without realising that meant 11am our time. We wanted to go out that day, but waiting to call meant we lost most of the morning. And we had the number wrong, so they didn’t answer. Staying in touch with the UK is still important to both of us, and with this being still temporary accommodation, e-mail is the main tool for talking. It’s always good to get mail. The APs are off on their big World Tour shortly, and they surprised me by saying they weren’t taking the laptop with them. I know Dad’s worried about security and theft and whatnot, but I wouldn’t be without the link to the rest of the World if you gave me the choice. All of this sounds a bit negative, but it’s not meant to. The hard parts are difficult, obviously, but I’m amazed how few of them there are. Me and Middle Weasel took a jaunt to the big mall the other day, riding the Skytrain like locals and shopping until we needed a hit from Starbucks. We knew where we were going and we got there and back safely. On the train journey I saw an amazing thing (if you’re from the UK, that is…) Some Teens got on, one stop after we did. They were dressed weirdly, and talking about their school day in derogatory terms and loud voices. One of the girls remarked that she knew where they were going but had no clue which stop to use. Immediately three people, of varying genders, ages and employment, took time to explain the best route to take to their destination. No one was afraid of these three just because they looked different. No one was afraid they might be knifed for speaking uninvited. No one stared huffily out the window and remarked “There is a map on the wall, you know” to no one in particular*. Ok, so this isn’t the London Underground. Canada’s a nice place! By the way, feel free to jump in and say this kind of thing happens on the Underground everyday…I just know it hasn’t happened anytime I’ve ridden the Tube, and I would have been too scared to offer anyone the time, had they asked, which they never have. Today we found the car we didn’t know we were looking for, and by forcing a line of terrified numbers to jump through a burning hoop of spreadsheet, Mrs Dim has decided we can afford it. The Hire Car will go back and we will own a little bit more of our Canadian Dream. But tomorrow I take the weasels to the Rental House to wait for my piece of Canada to arrive – the Cable Guy is coming to hook up the house! *Although it was a close run thing. I managed to restrain myself at the last second. This entry was posted in Uncategorized and tagged accounts, cable, Canadian Dream, car, English bay, London Underground, Mrs Dim, rental house, showroom, Sky Train, Stanley Park, Starbucks, weasels. Bookmark the permalink.